Please visit: sitchiniswrong.com for more articles and information. Readers of Zecharia Sitchin’s books, particularly The 12th Planet, will recognize the above seal, VA 243 (so named because it is number 243 in the collection of the Vorderasiatische Museum in Berlin). 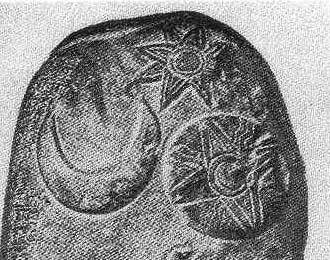 This seal is the centerpiece of Sitchin’s theory that the Sumerians had advanced astronomical knowledge of the planetary bodies in our solar system. This knowledge was allegedly given to the Sumerians by extraterrestrials, whom Sitchin identifies as the Anunnaki gods of Sumero-Mesopotamian mythology. In the upper left-hand corner of the seal, Sitchin argues, one sees the sun surrounded by eleven globes. Since ancient peoples (including the Sumerians according to Sitchin) held the sun and moon to be “planets,” these eleven globes plus the sun add up to twelve planets. Of course, since we now know of nine planets plus our sun and moon, part of Sitchin’s argument is that the Sumerians knew of an extra planet beyond Pluto. This extra planet is considered by Sitchin to be Nibiru, an astronomical body mentioned in Mesopotamian texts. Sitchin’s works detail his contention that Nibiru passes through our solar system every 3600 years, and so some believers in Sitchin’s theory contend that Nibiru will return soon. 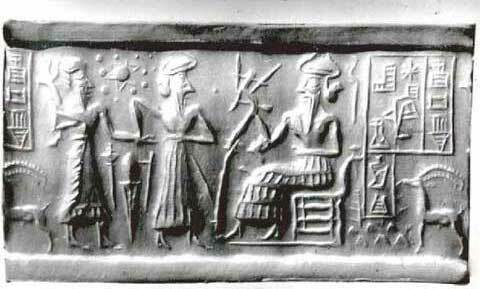 Some followers of Sitchin’s ideas also refer to Nibiru as “Planet X”. Is Sitchin correct – in whole or in part? Is Nibiru a 12th planet that will soon return? Does VA243 prove his thesis? Unfortunately for Sitchin and his followers, the answer to each of these questions is no. This paper will focus on the heart of his theory, VA243. Nibiru is the subject of another paper on my website. 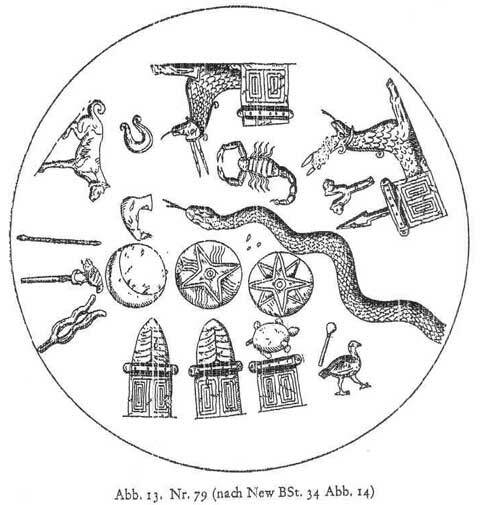 The study of cylinder seals is actually a very specialized sub-discipline within Sumerology and Assyriology.a It is possible to determine, through the efforts of cylinder seal specialists of the recent past and current experts, to decisively say that Sitchin’s interpretation of this seal is deeply flawed and lacks scholarly merit. In short, his theory is false and is unsupported by the seal itself. 1) The inscription on the seal (left hand and right hand sides – which are not discussed by Sitchin) says nothing about planets or any element of astronomy. Rather than offering an independent translation, I will defer to authorities on Sumerian seal inscriptions in this regard to avoid any charge of bias. 2) The alleged “sun” symbol on the seal is not the sun. We know this because it does not conform to the consistent depiction of the sun in hundreds of other cylinder seals and examples of Sumero-Mesopotamian artwork. I will describe the typical depiction (determined with certainty because it appears with texts about the sun god [Shamash Akkadian, known as Utu in Sumerian]) and provide image examples. Sources are provided for readers to check for themselves. 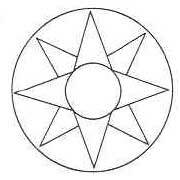 The “sun” symbol is actually a star (which in Mesopotamian art could have six or, more commonly, eight points). Lest the modern reader retort that “well, the sun is a star,” I offer several images where the star symbol and the sun symbol (which again, is not that in VA243) are side-by-side and distinct from one another. 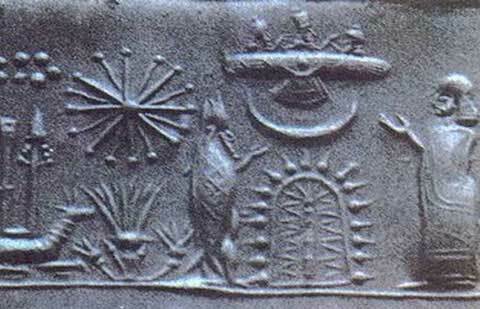 The Sumerians and Mesopotamians distinguished the sun from stars by using different symbols – and associating each symbol with the sun god and other gods, respectively. There is simply no ancient Sumero-Akkadian evidence to support Sitchin’s identification. (A) It is singling out a deity or special star and associating it with other stars in some sort of zodiacal representation. I don’t consider this likely because there are other far clearer representations of zodiacal constellations. Unless there are clear zodiacal connotations, a star was symbolic of a deity, which brings us to the second option. (B) More probable is the idea that the central star stands for a deity that has some association with fertility (as in crops) since the inscription describes an offering made by a worshipper (who is named) to a seated god who is associated in the seal with fertile harvest. Since there are two other figures in the seal in addition to the seated god, and one is the offerer, the remaining figure is likely a deity also associated with the offering. In favor of this possibility are the “implements” shown on the seal with respect to these two figures facing the seated god and the figure’s headdress. 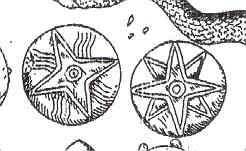 Also in its favor is the fact that there are literally hundreds of such “offering seals,” and many have a star in upper proximity to the figures’ heads, signifying the figure is a deity (see the example). 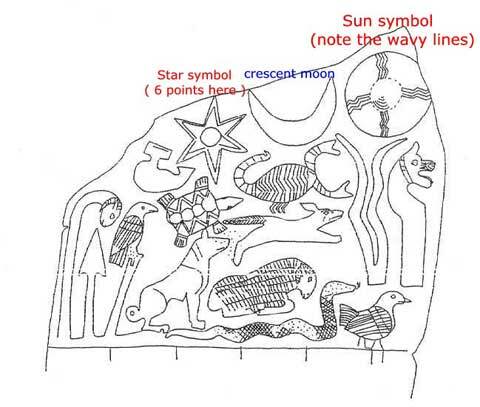 (C) Since the star is surrounded by eleven other stars (dots), the artistic depiction could stand for the lead god of the Mesopotamian divine council and its other eleven (upper tier) members. Recall that (as Sitchin again points out) the Mesopotamian council had 12 members. I have noted before that the 12 member council isn’t always consistent in Mesopotamian religion (at times eight gods are considered the council), but 12 is the more prevalent number. This thesis is attractive, but I can’t say there is much to commend it over option B. The reader might be thinking at this point, “Well, isn’t the sun god the leader of the pantheon – so if this symbology points to the divine council the center symbol could still be the sun?” This would be an erroneous line of thought since in Sumero-Mesopotamian religion the sun god is NOT the high god; the high god is Anu (later, Marduk), not Shamash. These options are admittedly subjective, but one thing is certain – the “sun” symbol does not conform to the abundantly frequent symbol for the sun in Sumero-Mesopotamian art. We are not dealing with a depiction of the solar system. Astronomer Tom van Flandern pointed this out years ago anyway, since the sizes of the “planets” around the alleged sun do not conform to the correct sizes of the planets and there distances from the pseudo-sun are not depicted in such a way as to depict elliptical (or at least varying) orbits. The link to van Flandern’s critique is on my website. 4) There is not a single text in the entire corpus of Sumerian or Mesopotamian tablets in the world that tells us the Sumerians (or later inhabitants of Mesopotamia) knew there were more than five planets. This is quite a claim, but is demonstrable through the work of scholars who specialize in cuneiform astronomy. Below I list all the major works on cuneiform astronomy (catalogues of texts, dissertations / books) and invite readers to check them out of a library and look for themselves. Literally every cuneiform text that has any astronomical comment (even with respect to astrology and omens) has been translated, catalogued, indexed, and discussed in the available academic literature. The tablets are often quite detailed, even discussing mathematical calculations of the appearance of planetary bodies in the sky, on the horizon, and in relation to other stars. The field is by no means new, and is considerably developed. All of the above facets of the discussion are now offered in more detail with bibliography. So the full (rather boring) inscription of VA243 reads: “Dubsiga, Ili-illat, your/his servant.” Nothing in the inscription suggests anything remotely to do with astronomy or planets. “The seated figure is a god; the ‘flounced’ garment is normal for deities (though kings start wearing them a little later); deities also have the distinctive headdress. Most scholars call it a ‘horned’ headdress, but I’ve always thought it looked more like flames than horns. Ancient texts often refer to deities having a bright, shining, brilliant aspect [this is true across the ancient near east – witness the “shining one” terminology I discuss in The Façade and in several papers on my website]; they don’t mention horns . . . 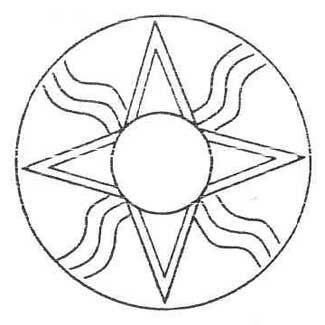 The introducing figure also has the ‘horns’ of divinity” [this is a strong contextual argument that the symbol – again, it’s not the “sun” – to the upper left of the introducing figure is a star. Precisely because they SHINE, stars were associated with deities. Shamash, the sun god, had his own symbol of the sun. See below for what it looked like].